A 3-Step Anti-Blemish System, providing a perfect skincare routine for oily and acne-prone skin. Specifically formulated for oily, and acne-prone skin. An easy 3-step regime inspired by dermatologists, which is clinically proven to reduce the appearance of blemishes, unclog pores and minimise pore size whilst keeping skin moisturised and reducing the appearance of brown and red marks. After just 12 hours, skin looks smoother, is mattified and blemishes appear less inflamed. After 4 weeks the size and appearance of spots and blemishes are reduced by 52%, blackheads and marks left by spots are reduced. Use every morning and evening. Suitable for those prone to allergic reaction. Step 3: Treat and hydrate with Effaclar Duo [+] 40ml : Visibly reduces the appearance of spots and blemishes, helps to reduce marks and controls shine. Provides 24-hour hydration. Effaclar has benn rigorously dermatologically tested to ensure it is suitable for use on even the most sensitive skin. The minimalist formula contains no parabend, no preservatives, no soap, no colourants and no lanolin. It is hypoallergenic and non-comedogenic (wont block pores). DERMATOLOGICALLY TESTED. MINIMALIST HYPO-ALLERGENIC FORMULA. *Survey of 249 dermatologists at the British Association of Dermatologist's Conference, July 2015. "Survey conducted by La Roche-Posay. 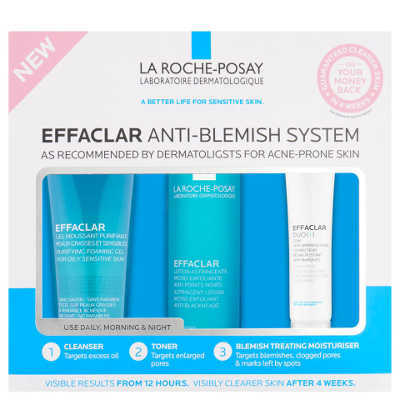 La Roche-Posay really understand acne-prone skin and the Effaclar range is great." Dr Emma Wedgeworth, Consultant Dermatologist. 1. Cleanse - Lather a small amount with water and massage onto the skin using gentle circular movements. No need to scrub. Avoid the delicate eye area. Rinse throughly. 2. Tone - Apply to cotton pad and gently sweep over the entire face. Avoid the delicate eye area. No need to rinse. 3. Correct & Hydrate - Applyu a thin layer of cream over the entire face before make-up. Avoid the eye contour.